Mum and baby yoga classes are a great way to spend time with your baby in a relaxed environment. You can gain confidence in handling your baby, learn how to soothe colic, aid sleep, etc. Women can come back into their bodies and start to stretch out areas that may have become tight during pregnancy or when feeding their baby. If you are looking for mum and baby yoga classes in your area, why not consult the Yoga Mama Registered Teacher directory? As Yoga Mama expands, new teachers are joining our community both here in the UK and internationally. 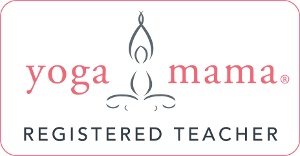 All of our teachers are highly qualified and are easily identifiable with the Yoga Mama Registered Teacher Badge. Search for mum and baby yoga classes near you here.